Kingsland residents are actively engaged in their community and keeping them informed is our top-priority. 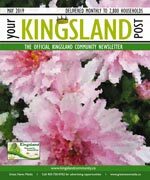 Your Kingsland Post is the official community newsletter, and covers community news and is published monthly to keep content current and relevant. Delivered to every household, apartment, and business, every resident is acquainted with the community’s most important information. The Kingsland Community Association registered their Provincial Society on May 18, 1960; in the year 2010 Kingsland Community celebrated their 50th anniversary as a Society. The MacDonald family home was the only residence in the area of Kingsland for many years. Mr. and Mrs. Albert Fowler immigrated from England, and in 1912 built their home in the Kingsland area. Other settlers in the Kingsland area in the early 1900’s included the Websters, the Bannisters and the Fletchers. There are many aspects of the membership program provide unique educational and recreational experiences. Being a member not only provides an opportunity to voice one's opinions in their community, but allows individuals to play a vital role in their community as well. In the City of Calgary’s 2012 municipal census, Kingsland had a population of 4,513 living in 2,383 dwellings, a 2.2% increase from its 2011 population of 4,418. With a land area of 1.3 km2 (0.50 sq mi), it had a population density of 3,470/km2 (9,000/sq mi) in 2012. Residents in this community had a median household income of $43,647 in 2000, and there were 20.1% low income residents living in the neighborhood. As of 2000, 16.1% of the residents were immigrants. A proportion of 54.1% of the buildings were condominiums or apartments, and 63.4% of the housing was used for renting. For more detailed info visit the City of Calgary community profiles.